Marjoram improves digestive function, can help relieve pain, and has potent antibacterial and antiviral properties. Parsley is a great source of vitamin K and vitamin C. It also contains myristicin, a volatile oil that shows promise to inhibit tumor formation (as seen in animal studies). Parsley also contains, luteolin, a flavonoid that helps prevent oxygen damage to your cells. Mint doesn’t just help freshen your breath. It has high antimicrobial properties and can also help relieve gastrointestinal upset including cramps, gas, and nausea. It also contains important minerals including calcium, zinc, magnesium, and copper. 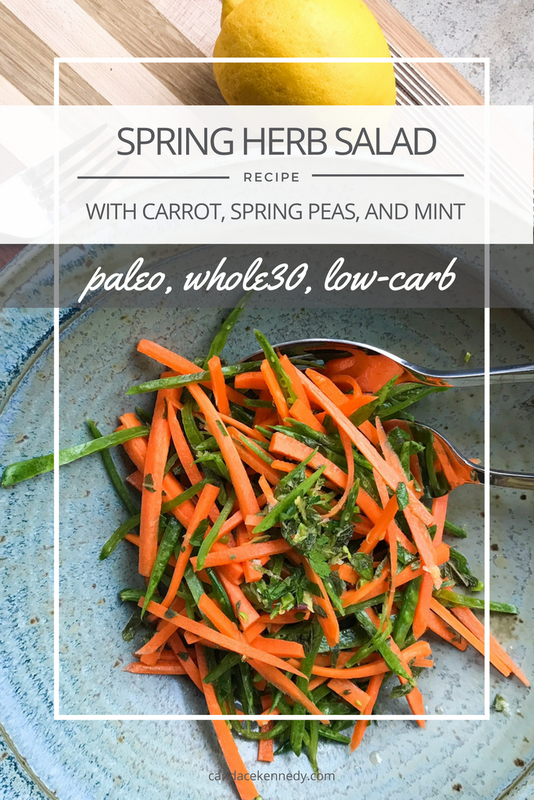 These herbs, combined with sweet carrots and spring peas, make for a flavorful and easy-to-make salad. Serve it alongside Lamb Meatballs with Muhammara or Lemon and Herb Pan-Seared Chicken Thighs. Add your peas, carrots, and scallion to a medium-sized bowl. Combine the mint, parsley, marjaram, lemon zest, lemon juice, sea salt, and olive oil in a small bowl to make the dressing. Coat the pea and carrot mixture with the dressing. Add more sea salt, to taste, if you like. such gorgeous pics! love all the info on the ingredients, too! thanks, @mariethebee! Any favorite spring herbs you’re cooking with these days?